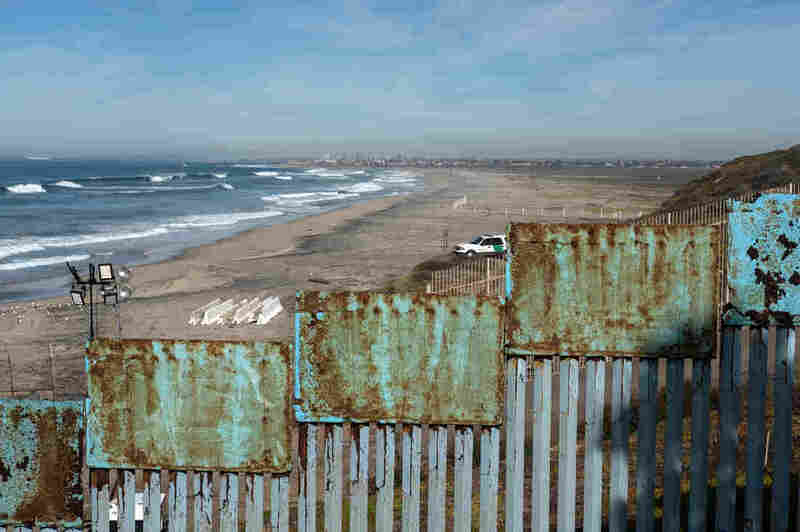 A Waiting Game For Immigrants And Border Agents On 2 Sides Of The Wall While Border Patrol agents build up fences in San Diego to deter what it views as a national security threat, Central American migrants waiting in Tijuana wonder if the journey was worth the effort. Border Patrol guards a section of the U.S.-Mexico border fence as seen from Playas de Tijuana, Mexico. 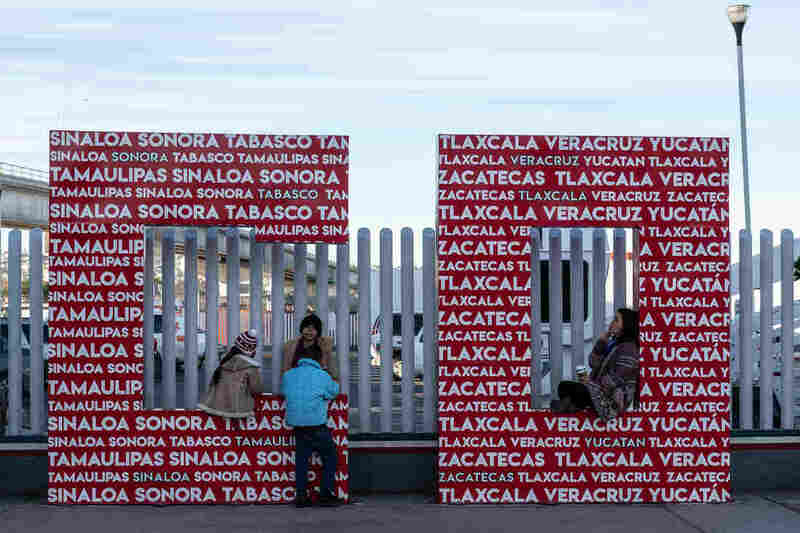 For Tijuana, the Central American caravans that arrived there in November have become a humanitarian challenge. For the Trump administration, they are a national security threat, as well as a potent and convenient symbol of why the United States needs stronger border security. 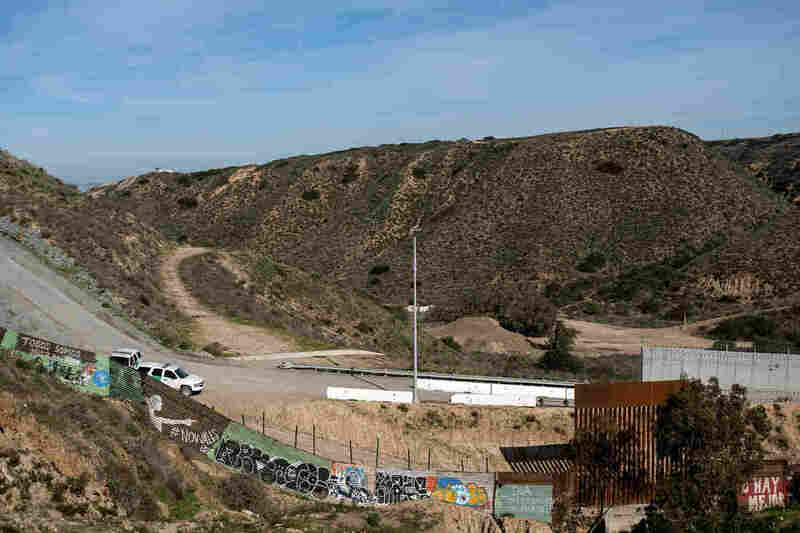 "We don't know who else is in that group," says Rodney Scott, chief of the San Diego Border Patrol Sector. "The sheer numbers indicate there are nefarious people within the caravans." In the months since the caravan arrived in early November, hundreds of migrants have lost patience and illegally jumped the border fence. Scott says his agents have arrested more than 2,500 of them in the no-man's land between steel border barriers. On a recent visit to Tijuana, the caravan migrants looked more bedraggled than nefarious. Migrants seeking an asylum appointment with U.S. Customs and Border Protection officers wait at El Chaparral port of entry in Tijuana. Their numbers have dropped dramatically from around 6,000 to fewer than 2,000 today. They're staying in makeshift shelters throughout the city, waiting week after week to hear their own number called out in an announcement that is made every morning in a small park near the U.S. port of entry. "Today we begin with number 1,627. Please take your place in line," says a man with a bullhorn. And with that, Darling Adalid Mercado is the first in a ragged line of caravan migrants who will cross the border on this morning and request asylum from U.S. immigration agents. Each day, only 40 to 60 people are allowed in. Darling Adalid Mercado, 19 (center), left his home in Ocotepeque, Honduras, three months ago to flee town thugs who wanted to recruit him. Adalid Mercado is a clean-cut 19-year-old in a ball cap, with a crucifix around his neck. He says he left his home in Ocotepeque, Honduras, three months ago to flee town thugs who wanted to recruit him. He's angry at the volunteers who organized the caravan, who he says gave them bad advice. "Pueblo Sin Fronteras [Village Without Borders] is an organization that told us to join the caravan, that everything would be easy," he says. "Then you're on the road and it's really hard, really difficult. They deceive you. They say we're going to the Mexico-U.S. border and we'll all cross together. But the truth is you can't do this. It's illegal." 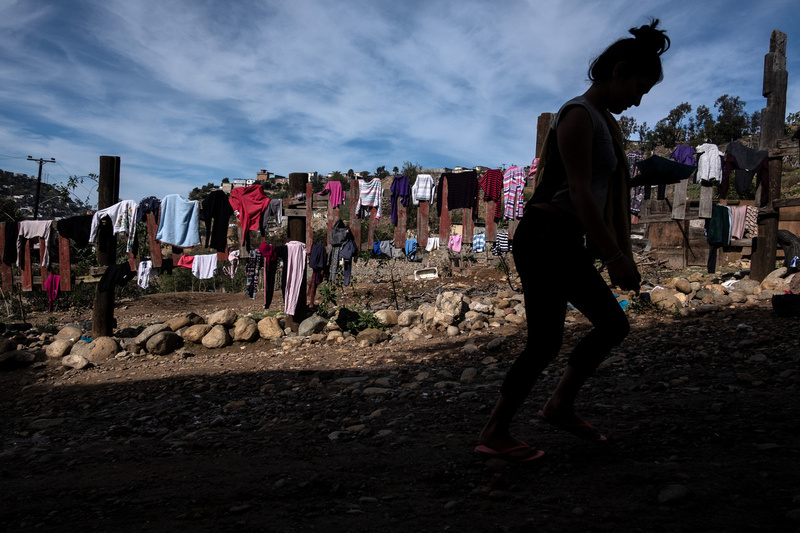 A woman walks near the temporary shelter run by Ambassadors For Christ in Tijuana. Adalid Mercado says that once he got to Tijuana, other activists goaded him, " 'Come on, Darling, jump the fence!' " But he realized that he would face harsh punishment from U.S. authorities, and it was better to wait for his number to come up. Once he crosses, if he's not sent to a migrant detention facility, Adalid Mercado wants to join his brother in San Antonio and find work. Pueblo Sin Fronteras — a Mexico-based immigrant solidarity organization — posted a response on its Facebook page to recent criticism of its actions. They emphatically reject that "criminalization and defamation of our work" accompanying the caravan. The group vows to continue to support and protect the human rights of Central American migrants in transit. The caravan numbers have dropped dramatically from around 6,000 to fewer than 2,000 today. The waiting game in the squalid shelters in Tijuana is grating on everyone's nerves. Blanca Irias and her family, from Tegucigalpa, Honduras, are cooling their heels at a shelter run by an evangelical church called Ambassadors For Christ, situated next to a fetid creek popular with a family of mottled hogs. She's a heavyset woman with weary eyes. They're staying in a camping tent set up in the church sanctuary. Every day, she, her daughter, son-in-law and two grandchildren discuss what their next move should be. Blanca Irias (right) and her daughter, from Tegucigalpa, Honduras, are staying in a camping tent set up in the church sanctuary in Tijuana. "We're frustrated. We've been here a long time," Irias says with a sigh. "We're discussing the possibility of staying here in Tijuana because there's work and it pays well. There are days when we also wonder if we should jump the fence. We don't know what we'll do." More and more Hondurans who came in the caravan are deciding to stay in Tijuana. Mexico has issued more than 2,000 humanitarian visas that allow them to work in this booming border city on the Pacific coast. While the town leadership initially was hostile about their arrival, many citizens have warmed up to them. "We've seen these people working around town, in barber shops, selling clothes, taking jobs in the assembly plants. They are people who want to get ahead. We don't have any problem with them. 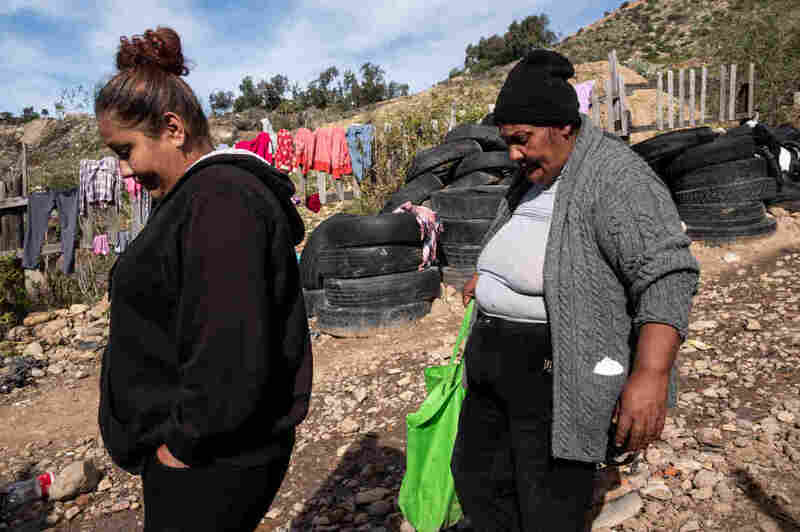 Here in Tijuana, there's work for anybody who's willing to work," says Juan Carlos Rodriguez Marquez, a local lawyer who was walking his dog along a beachside park. Santos Favian Gomez washes dishes for a humanitarian group, World Central Kitchen. He says he fled marauding gangs in Choluteca, Honduras. Santos Favian Gomez says he fled marauding gangs in Choluteca, Honduras. 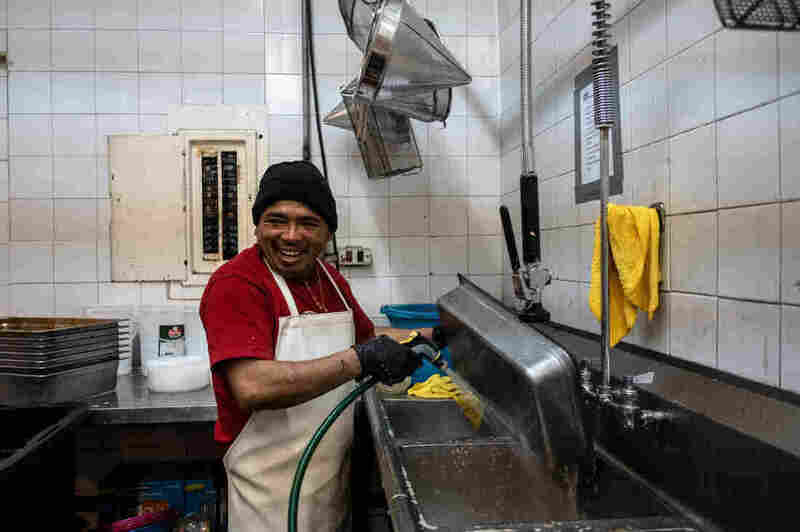 He has taken a job washing dishes for a humanitarian group, World Central Kitchen, that prepares hundreds of free meals for the migrants. 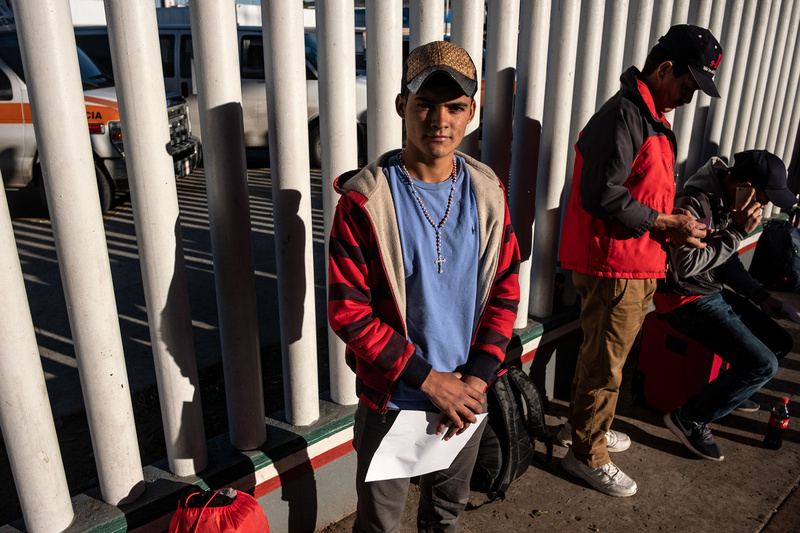 "I'll remain in Tijuana," he says. "Because I hear if you cross into the United States, they'll throw you in jail. It's better to work here than be a prisoner over there." Favian Gomez, 41, says he traveled here alone. He will save a little money to send home to his wife. He'll try to find a house so he can move out of the crowded shelter where he's staying. And he'll make his home in Tijuana, at least temporarily. "It's pretty here," he says, scrubbing beans from a pan, "and the people are nice." He says any arrangement he can work out in Tijuana is better than returning to Honduras. 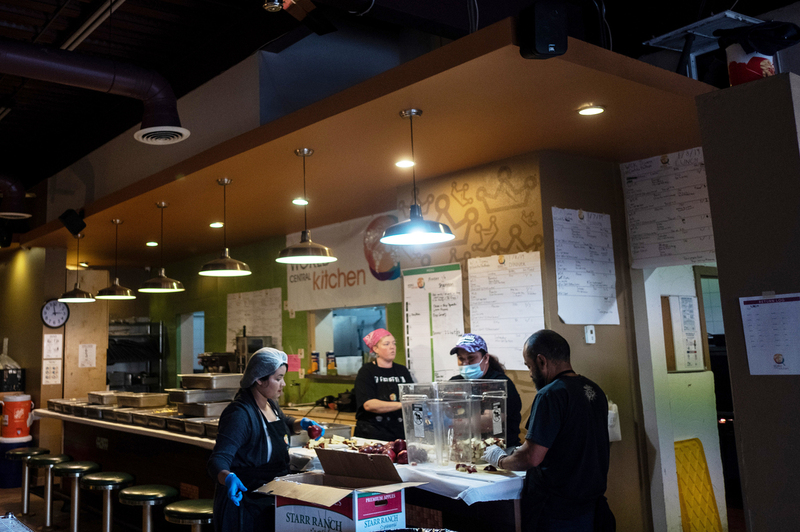 The World Central Kitchen prepares hundreds of free meals for the migrants in Tijuana.